On the 29th (Mon), steep yourself in history at Eglise Sainte Marie Majeure. On your second day here, don't miss a visit to Escalier du Roi d'Aragon (King Aragon Steps), then explore the fascinating underground world of Grottes de Bonifacio, and then enjoy the sand and surf at Plage de Stagnolu. To see where to stay, traveler tips, photos, and tourist information, read our Bonifacio holiday website . Manchester, UK to Bonifacio is an approximately 7-hour flight. You can also do a combination of car and ferry; or do a combination of bus, car, and ferry. Due to the time zone difference, you'll lose 1 hour traveling from Manchester to Bonifacio. In June, Bonifacio is somewhat warmer than Manchester - with highs of 32°C and lows of 17°C. Finish your sightseeing early on the 1st (Wed) so you can drive to Calvi. Calvi is a commune in the Haute-Corse department of France on the island of Corsica.It is the seat of the Canton of Calvi, which contains Calvi and one other commune, Lumio. Step off the beaten path and head to Speed Boats Tours and Phare de la Pietra. Step out of the city life by going to Punta Spano and Scuba & Snorkeling. Next up on the itinerary: take some stellar pictures from Village abandonné d'Occi, steep yourself in history at Citadelle de Calvi, make a trip to Les Calanche Cliffs, and look for all kinds of wild species at Nature Reserve of Scandola. Take the guesswork out of planning a Calvi vacation by using our trip itinerary maker. Traveling by car from Bonifacio to Calvi takes 4 hours. Alternatively, you can take a bus; or do a combination of bus and train. In July, plan for daily highs up to 34°C, and evening lows to 23°C. Wrap up your sightseeing on the 4th (Sat) early enough to travel to Les Eyzies-de-Tayac-Sireuil. Roc de Cazelle and Chateau des Milandes will appeal to history buffs. Escape the urban bustle at Kayaking & Canoeing and Les Grottes de Maxange. Venture out of the city with trips to Belves (Le Chateau de Belves & Cave Dwellings). 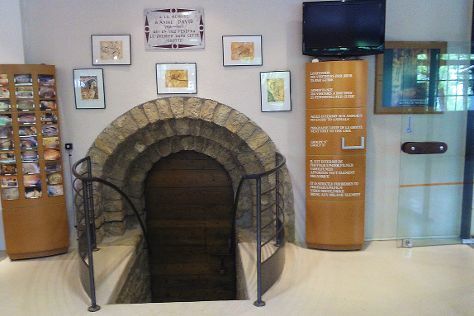 And it doesn't end there: Head underground at Grotte du Grand Roc, tour the pleasant surroundings at Au pas de l'ane. Location d'anes, step into the grandiose world of The Maison Forte de Reignac, and make a trip to Roque Saint-Christophe Fort et Cite Troglodytiques. Find out how to plan Les Eyzies-de-Tayac-Sireuil trip without stress by asking Inspirock to help create an itinerary. You can do a combination of flight and train from Calvi to Les Eyzies-de-Tayac-Sireuil in 7 hours. Alternatively, you can do a combination of flight and bus; or do a combination of bus, flight, and train. Traveling from Calvi in July, Les Eyzies-de-Tayac-Sireuil is a bit cooler at night with lows of 17°C. Wrap up your sightseeing on the 7th (Tue) early enough to drive to Saint-Cirq-Lapopie. Saint-Cirq-Lapopie is a commune in the Lot department in south-western France. On the 8th (Wed), look for gifts at Le Musee Du Vin, then take in the architecture and atmosphere at Bourg Medieval de Saint-Cirq Lapopie, then explore the fascinating underground world of Grotte du Pech-Merle, and finally explore the historical opulence of Chateau de Cenevieres. To see maps, more things to do, traveler tips, and other tourist information, go to the Saint-Cirq-Lapopie tour itinerary planner. Traveling by car from Les Eyzies-de-Tayac-Sireuil to Saint-Cirq-Lapopie takes 2 hours. Alternatively, you can do a combination of train and bus. In July, daytime highs in Saint-Cirq-Lapopie are 32°C, while nighttime lows are 17°C. Cap off your sightseeing on the 8th (Wed) early enough to go by car to Perpignan. Perpignan is a city, a commune, and the capital of the Pyrénées-Orientales department in southern France. Eschew the tourist crowds and head to Scuba & Snorkeling and Chateau de Castelnou. Popular historic sites such as Chateau de Peyrepertuse and Chateau Comtal are in your itinerary. Change things up with these side-trips from Perpignan: Abbaye de Fontfroide (in Narbonne), Carcassonne Center (Cathar Castles & Eglise Saint-Nazaire) and Chateau de Queribus (in Cucugnan). Next up on the itinerary: learn about winemaking at Domaine Boudau, look for all kinds of wild species at Sentier du Littoral, take in the architecture and atmosphere at Cathedrale St-Jean, and explore the striking landscape at Orgues d'Ille Sur Tet. To find where to stay, traveler tips, and other tourist information, read our Perpignan trip planner . You can drive from Saint-Cirq-Lapopie to Perpignan in 3.5 hours. Alternatively, you can do a combination of bus and train; or take a bus. Plan for somewhat warmer nights when traveling from Saint-Cirq-Lapopie in July since evenings lows in Perpignan dip to 22°C. Finish your sightseeing early on the 12th (Sun) so you can drive to Moustiers Sainte-Marie. Moustiers-Sainte-Marie, or simply Moustiers, is a commune in the Alpes-de-Haute-Provence department in southeastern France, a part of the Provence-Alpes-Côte d'Azur region and considered one of the "most beautiful villages of France".It lies at the western entrance to the Gorges du Verdon. Escape the urban bustle at Les Grottes de Villecroze and Les Gorges du Verdon. Your inner history buff will appreciate Notre Dame de Beauvoir and Abbey of Thoronet. Venture out of the city with trips to La Tuilliere (in Aups) and Lac De Sainte Croix (in Aiguines). The adventure continues: make a trip to Centre Ville. To find traveler tips, ratings, more things to do, and other tourist information, you can read our Moustiers Sainte-Marie trip planning site . Traveling by car from Perpignan to Moustiers Sainte-Marie takes 4.5 hours. Alternatively, you can do a combination of train and bus; or do a combination of train and taxi. In July in Moustiers Sainte-Marie, expect temperatures between 37°C during the day and 20°C at night. Finish your sightseeing early on the 15th (Wed) so you can travel back home.